Just after Mr Awesome and I got married we decided to redecorate our guest bedroom. 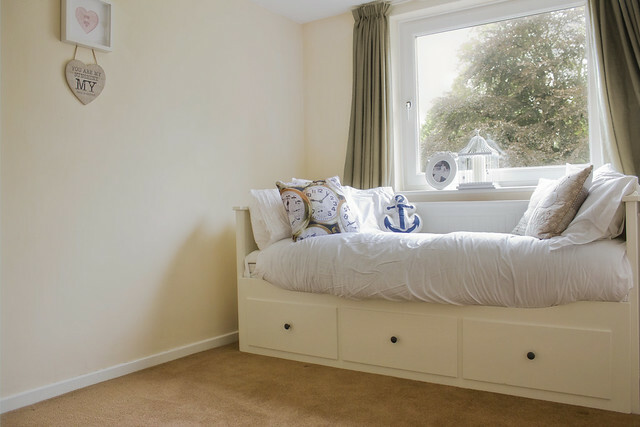 It functioned perfectly well as a guest bedroom, but we wanted something far more light and airy, and we wanted to actually make use of the room the other 358 days of the year that we didn’t have guests staying. Because Mr Awesome is especially awesome, he decided that I might like to have a more permanent sewing set-up so I didn’t have to drag my sewing machine out of the cupboard every time I wanted to use it. 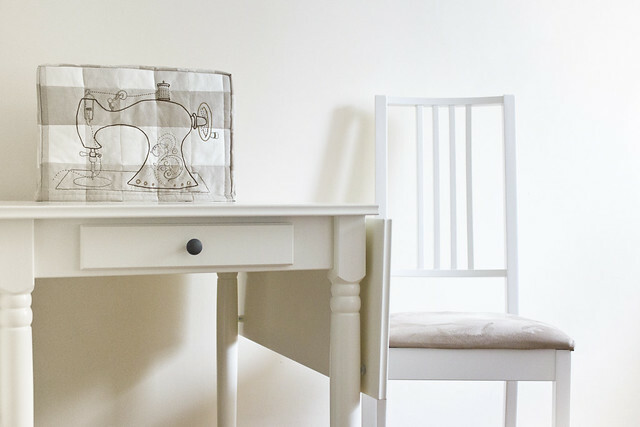 A day bed that converted to a double bed suddenly gave us both seating and loads of extra space to play with, so a drop-leaf table and chair later and I had a little sewing area. 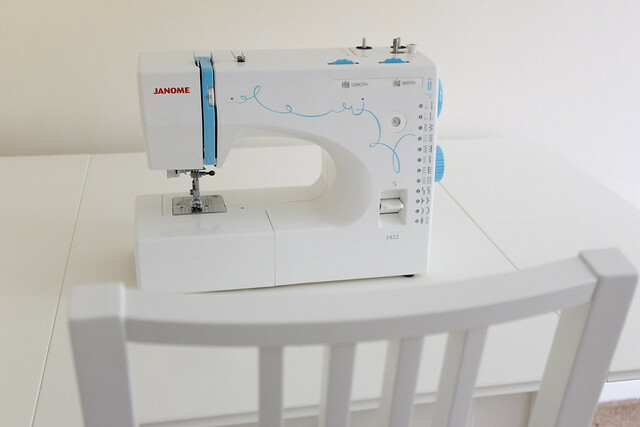 But my sewing machine has always looked a bit ugly to me, little workhorse that it is, and didn’t at all go with the decor. So I decided that I would try to make a cover for the sewing machine, both to keep it dust-free and so that it didn’t stand out quite so much in its neutral coloured surroundings. 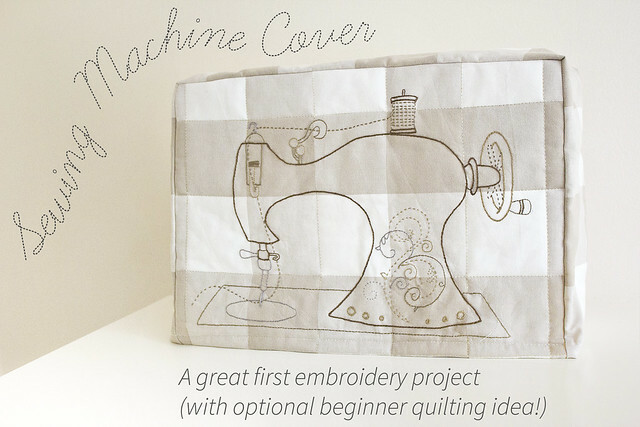 I decided, however, that I didn’t want to entirely hide the fact that it was a sewing machine, I just wanted it to be prettier, and so I decided to decorate the cover with an image of pretty, imaginary sewing machine. And I decided to make it padded, because in my mind this gave it just a little bit of protection, which doesn’t make much sense as this machine feels and looks like it is built to last through all manner of disaster. Come the apocalypse all that will be left on the planet will be a few headless cockroaches and this machine. Now, however, it will enter into the end of days wearing the Sewing Machine Equivalent of a ball gown. It’s like one of those teen dramas from the 90s where the loner girl played by an increasingly ageing Drew Barrymore suddenly becomes hot and therefore desirable. Don’t worry sewing machine, you, like all good geeks, were always desirable to the person that matters most. But let’s take a look at your new hot exterior. Most importantly to me, it now just seems to fit with the look of the room a bit more, and the padded cover just softens the look of the plastic boxiness within. But, rather nicely, there’s still clearly a sewing machine beneath, so I can still enjoy the room as being noticeably my sewing space without making guests feel like they are camping out in a hobby room. Also importantly, the cover was inexpensive to make, taking only a little of a very few materials. Because of this I decided to experiment a little with some new skills and ideas as if it hadn’t turned out to plan then I would not have wasted too much time and effort. So, this was my first real attempt at embroidery and I also made a very first step towards what I am going to think of as quilting. As I had drawn up the embroidery pattern for my own use and taken a few snaps along the way I decided to write the project up with a few pointers in case anyone wanted to print and use the embroidery pattern or make themselves their own sewing machine cover, and I will cover the steps and include the downloads over the coming few days. Other useful items not pictured are some dressmakers carbon paper for transferring the design, and usual sewing supplied such as pins, thread, hand-sewing needles, scissors, etc. The specific outer fabric I used was Ikea’s Berta Ruta, a heavy 100% cotton fabric. I’d actually recommend a very large, checked /striped fabric in light colours for this project if you were going to try a quilting technique for the first times as you have a few in-built lines to follow. Obviously you can draw some on with a washable or disappearing marker if you have another fabric, but this was a calculated shortcut on my part. Many people will have most of these materials already. 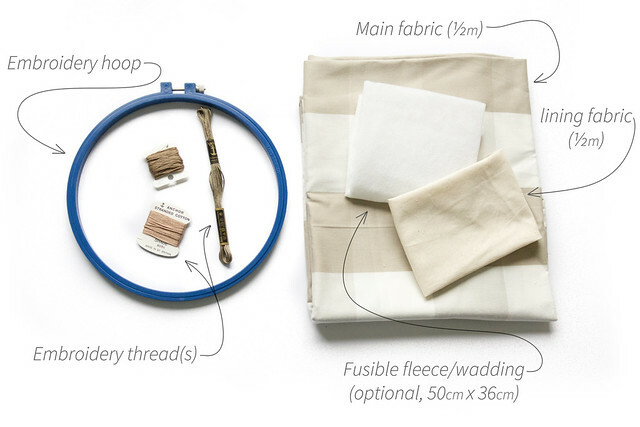 The only other things you need are a few pins, scissors and a sewing machine (which you are quite likely to have if you are making yourself a sewing machine cover) and if you are using the embroidery design then some dressmaker’s carbon paper to transfer the design will likely be very useful. I’ll upload the embroidery pattern and give further details of embroidering and making the sewing machine cover in the next post. very classy. the whole thing is so well executed, zombies not withstanding. Gorgeous embroidery, what a beautiful cover. Swanky! You’re quite the artist, Miss Mimi. Your guest room looks cozy (but not hopefully not so cozy as to encourage guests to overstay their welcome! ); mine is a disaster because my husband decided to turn it into an office but has instead only succeeded in turning it into a pigsty. Maybe someday, hopefully before too long, we’ll be able to afford our (larger) dream home so we can have both a guest room and his home office. Looks great and I do need a sewing machine cover. However I am not going to make this one because going on recent projects you will definite think I am your stalker!!! 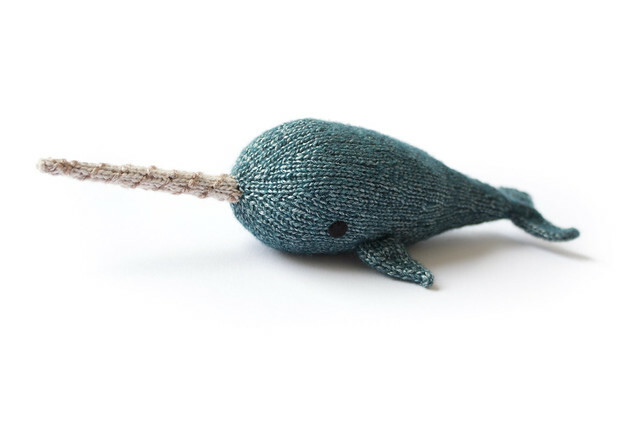 Perfect for your room and so stylish. I do love your style. I don’t know how strong the sun is where you live, but in Australia the sun can be brutal and it is important to protect your sewing machine’s plastic exterior from UV light which is another good reason to make a cover. Haha, well, I don’t think it is quite such an important consideration in the Midlands of the UK, but I do know that some plastics can yellow and weaken over time, so that’s a fantastic point – I may add that in to the final post on the cover as advice as to why a cover can be practical as well as attractive!